Shirts With Random Triangles: First Trailer For I Saw The Light Features Tom Hiddleston As Hank Williams. 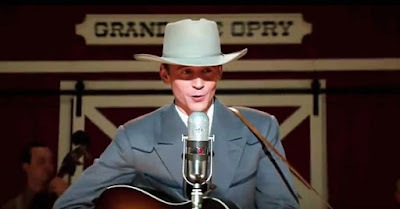 First Trailer For I Saw The Light Features Tom Hiddleston As Hank Williams. Tom Hiddleston as Hank Williams. Image via CBR/Spinoff Online. Ever wanted to hear Loki sing? Now's your chance. The first trailer for the Hank Williams biopic I Saws the Light has been released. Tom Hiddleston, most famous for bringing the Asgardian lord of mischief to life in Thor and The Avengers, plays the legendary country music pioneer. Fellow Marvel Cinematic Universe alum Elizabeth Olsen (The Scarlet Witch in Avengers: Age of Ultron) plays his long-suffering wife Audrey Mae. I Saw the Light is directed by Marc Abraham. best known as the producer for such films as Children of Men, The Rundown, and Tuck Everlasting. It opens in theaters on Mar. 25, 2016.